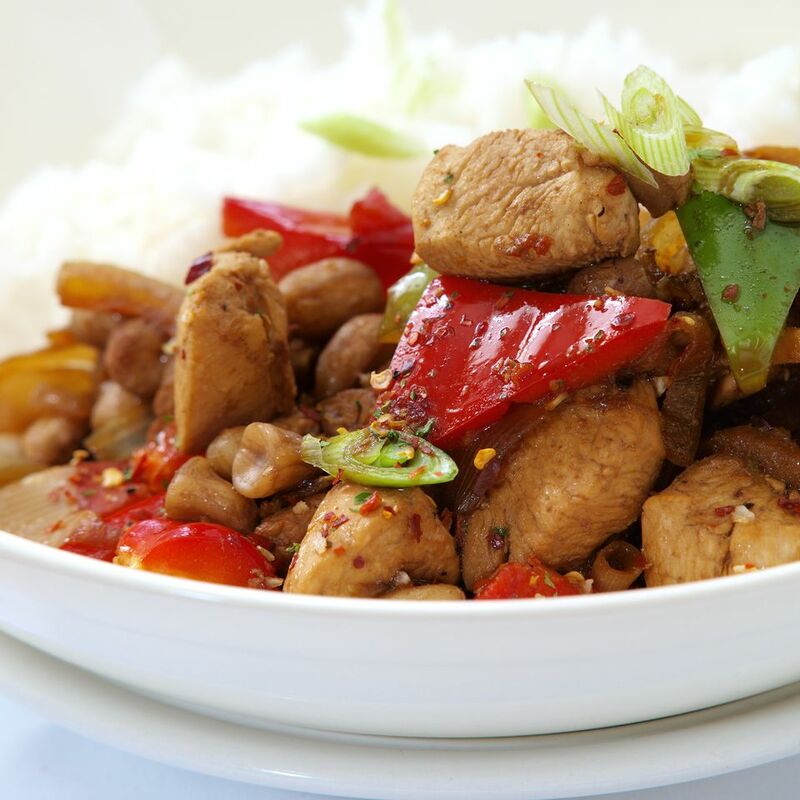 In this healthier version of traditional Kung Pao Chicken, the chicken is stir-fried instead of deep-fried, reducing the fat content. Cut the chicken into 1-inch cubes. Combine marinade ingredients, adding the cornstarch last. Marinate the chicken for 25 minutes. While the chicken is marinating, prepare the sauce and vegetables: In a small bowl, combine the dark soy sauce, rice wine, and sugar. Set aside. Cut the chilies in half so that they are approximately the same size as the chicken cubes. Remove the seeds. Peel and finely chop the garlic. Cut the green onion on the diagonal into thirds. Heat the wok over medium-high to high heat. Add 2 tablespoons oil. When the oil is hot, add the chicken. Stir-fry until it turns white and is 80 percent cooked. Remove from the wok. Add 2 tablespoons oil. When the oil is hot, add the garlic and stir-fry until aromatic (about 30 seconds). Add the chili peppers and the Szechuan peppercorn if using. Stir-fry briefly until they turn dark red. Add the sauce to the wok. Bring to a boil. Add the chicken back into the pan. Stir in the peanuts and the green onion. Remove from the heat and stir in the sesame oil. Serve hot.